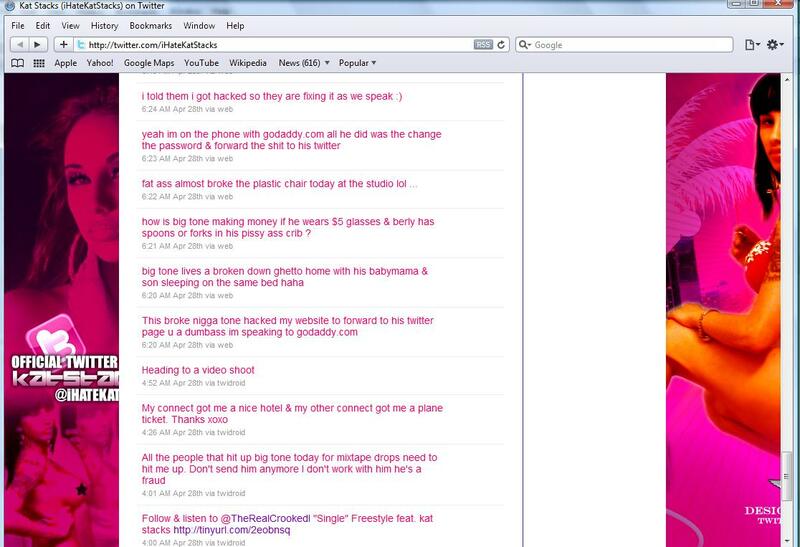 So as you know Kat Stacks 20 years old, is the female who was causing a headspin in the industry as the “Bigmouth Stripper / Hoe” I don’t know shorty personally but from what i have read off her personal page and publications she has serious issues. Kat Stacks is a stripper as well as a prostitute..she was beaten and verbally abused by many a rapper. The way she speaks to people I’m sure thats why she was beat, as well as her lifestyle; prostitution is a risky job. Recently she decided to make a you tube response video to the Young Money Crew. It went from her attacking them on an immature level saying how they have “bunk beds”, and they have young money because they have no money / they broke, to them abandoning her on the side of the road and only giviong her $25 out of $100 cab fare she needed. To see the video’s etc you can look her up on youtube. follow up videos – now she attackin mack .. I find it hilarious how on her twitter account she goes from cursing guys out to then saying “oh excuse my drunk tweet” , then going off about how her ex-manager (whom she left) lives w/ his baby moms and kid in a raggedy apartment. She states that he is currently making drops by editing a voice sample of hers and charging people. She personally made it known that she has a new email for contacts, and drops and to ignore him because he is stealing the public’s money. She says she was hacked on her web site and social networks then she got them back up again..basically she is media hungry and by exposing people in industry with her rants true or not true..her name is now a topic. My question is .. “WHO THE F*CK IS SHE ANYWAY”!!? ?… Nobody wanted drops before, i doubt they want them now.. I’m just saying..
anyway .. the public asked about this and so i blogged it otherwise..this is the last thing i care to speak on LOL ..